Brown ground beef and drain. Press draining beef to remove excess fat, then continue cooking. Sprinkle 1½ cups of Southwest Spice Blend over cooked beef, and stir well. Add 1 quart + 1 cup of water and allow to simmer for 15 minutes. CCP: Heat to 160 degrees F or higher for 15 seconds at the completion of the cooking process. In a bowl, combine salsa, tomato paste, 2 quarts water, and 1 cup of Southwest Spice Blend. Spray bottom of pan with pan release spray. 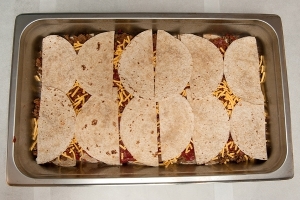 Line bottom of a 12" x 20" x 2½" steamtable pan with 16 half-tortillas to form the bottom of the pie. On top of the tortillas, spread 4 cups of the meat mixture. Next spread 2 cups of the salsa mixture over the meat mixture and sprinkle 1½ cups of the grated cheese over the salsa mixture. 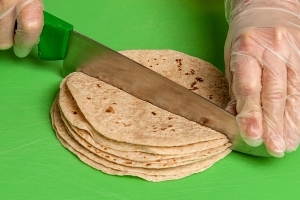 For the middle layer, lay 12 half-tortillas on top of the cheese. Repeat the process listed in step 8. For the top layer, lay 12 half-tortillas on top of the taco sauce. Spread 2 cups of the salsa mixture on top. 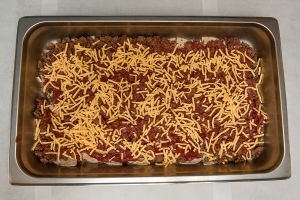 Sprinkle 1 cup of grated cheese evenly over the salsa mixture. Conventional oven: 350 degrees F, 30 minutes, covered. Convection oven: 325 degrees F, 20 minutes, covered. Combi oven: 325 degrees F, 20 minutes, covered. Let pie rest for 5 minutes before portioning. Cut each pan into 25 pieces (5 x 5). Serve immediately or cover and place in warmer. Portion 1 square per serving. Each portion provides 2¾ oz. eq. meat/meat alternate, ¾ oz. eq. enriched grain, ¼ cup red/orange vegetable. 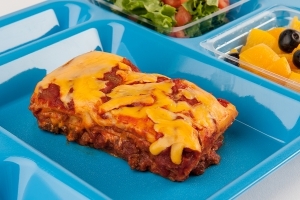 "Culinary Techniques for Healthy School Meals: Preparing Meats" provides seasoning and serving ideas for meats.